Fall is right around the corner! According to our calendars the first day of Fall arrives on September 22, which means we need to get our homes ready for the upcoming cooler months. This is a great time to tackle home projects and to-do lists. So what’s on your list? Below is a reminder of some of the basic home maintenance tasks we should review at least once a year, if not more. Call a professional to inspect and clean your chimney. Fireplaces that are regularly used during the season should have an annual cleaning to prevent dangerous chimney fires. Test your fireplace flue for a tight seal when closed. Check fireplace damper. If you live in a region that uses portable fans and air conditions throughout your home, now is a great time to start dismantling them and storing them for the Winter. This can be done at a gradual pace, by taking down air conditioning units and fans as the temperatures outside start to cool. Start with items in the most unused rooms such as a second bedroom or office and began preparing them for the upcoming Fall season. Replace batteries in your smoke and carbon monoxide detectors. Check fire extinguishers and review fire escape plan with your family. Clean dryer vents and exhaust vents. Tile and painted wood or concrete stairs can be slippery when wet or when a person’s shoes are wet. Resurface the treads with slip-resistant strips near the stair nosing. 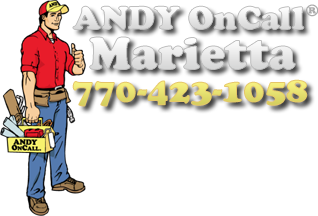 Don’t have the time or you are unsure how to maintain and/or make the proper repairs? Call ANDY ONCALL©! Water shutoff valve for each toilet and sink in your home and your washing machine. It’s also a good idea to keep a wrench nearby each of these vital shutoff valves. As well, every home should have a fire extinguisher in the kitchen and in the garage. You can avoid personal injury by following a few safety tips. Avoid overloading extension cords and electrical outlets. Turn off appliances when you are not using them. Do not store flammable liquids such as paint supplies near heating units. Keep flammable objects such as dish towels, curtains, and aprons away from stoves, and don’t wear loose fitting clothing while cooking. If a pan catches fire on the stove, cover it with a lid and turn off the heat. If a fire gets out of control, immediately leave the house and call the fire department using a neighbor’s phone or a cell phone. Develop an escape route out of your house and practice it monthly with your family. The fall season is the start of cooler weather and one of the most beautiful times of the year. Here are a few tips to remember in order to keep your home energy efficient as you transition to cooler temps and fewer daylight hours. Wrap your water heater with an insulated blanket to reduce heating loss and save money on your energy bill. Check your water heater temperature. For energy efficiency and child safety, set it no higher than 120°F. Install a programmable thermostat that allows you to pre-set the temperature for different times of the day and week. By setting the thermostat lower at night and during times when no one is home, you can conserve energy. Make sure your furniture is not blocking any heating vents or radiators. Use indoor appliance timers to turn lamps on and off. This saves electricity while giving your home a “livedin” look while you are out. Use the self-cleaning cycle of your oven right after you finish baking. That will give it a head start in heating up.